A paper based on my thesis work was recently accepted to the journal Physical Chemistry Chemical Physics. I helped researchers at the IMDEA Materials Institute in Madrid, Spain apply the phase-field model from my thesis to the NiAl-Cr ternary eutectic superalloy. They connected my model to a database of thermodynamic properties and were able to simulate the growth of the complicated microstructure in this system. Superalloys are a special class of metals that are used to make jet turbine blades because they are very strong and resistant to deformation at high temperatures. I went mooning last night, and got a spectacular view of the super-mega-ultra blood moon eclipse. The skies in Boston being perfectly clear which made for some great photographs. I shot the picture below from my roof, surrounded by all the light pollution of Kendall Square. I was surprised by all of the stars which showed up in the photographs, which were not visible to the naked eye. 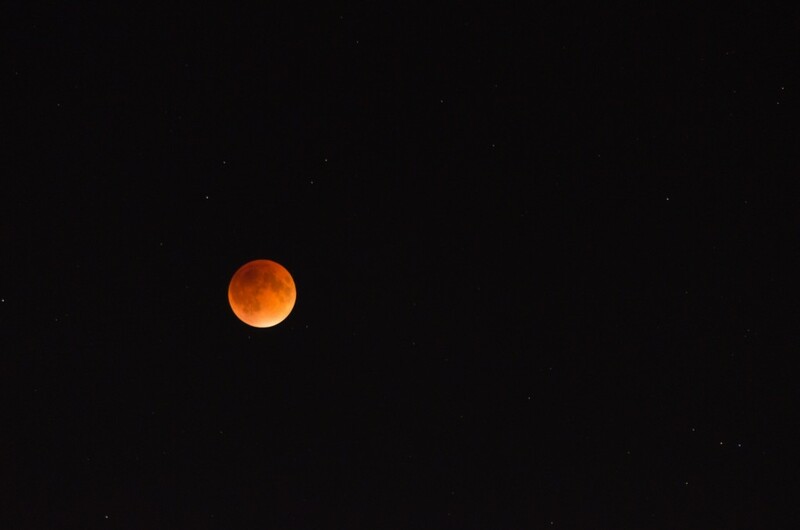 Blood moon eclipse over Boston, taken from my roof in Cambridge at 10:47pm, near the peak of the eclipse. This was 3 second exposure with a 200mm telephoto lens.